Program Contents: 82 page Student Manual, 138 page Instructor’s Manual, 272 page Power Point Presentation Manual and CD-ROM. A curriculum designed to help students with disability understand and embrace their own sexuality by learning how to make and accept responsibility for making personal choices. 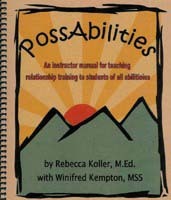 Teacher’s Manual, Student Manual and Power Point printout provide step-by-step guidance for examining relationship and self-esteem issues, including: self-image, emotions, values, and attitudes; relationships, sexuality, health, safety and positive adult behavior.